The president of the Hamtramck teachers’ union, Michelle Cook (far right), speaks to fellow teachers and other union members about the state’s Right to Work law that went into effect last week. Hamtramck teachers missed a deadline to extend their contract for another two years before the state’s new “Right to Work” law went into effect last week. That means when the contract between the Hamtramck Federation of Teachers and the district expires on Aug. 31, any new teacher hired will have the option to not join the union. Michelle Cook, the president of the teachers’ union, said contract talks hit a snag when the district couldn’t get an “ironclad” guarantee from the union to cover any financial retribution from the state. State officials were threatening districts and universities with severe financial penalties if employment contracts were extended before the Right to Work law went into effect. Schools Superintendent Tom Niczay confirmed that issue was the hang-up. “That was probably the major issue,” he said. Cook said that the union is also looking for “options that would give members an increase” in wages. However, the issue of salary increases is likely sensitive given that the district’s janitors agreed to a 25 percent wage cut and maintenance workers agreed to a 15 percent reduction. Niczay said healthcare costs are expected to rise this year. There are 171 teachers in the district. The district’s operating budget is approximately $35 million a year. Currently, the district is operating with a deficit, but there is a plan in place to come out of the deficit within two years. 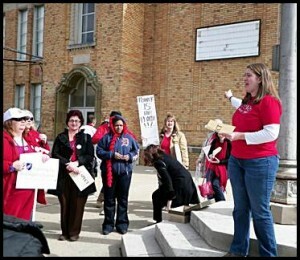 Although teachers were disappointed in not getting a contract extension, they rallied on Thursday outside of the high school. “We stand in the shadow of what was Copernicus Junior High. In April of 1965, teachers sat down in this building for four days to stand up for their profession and demand respect. And they were not alone in their fight. Brothers and sisters from other unions supported them supplying food and showing support for their cause. “Today we stand up together in the face of Right to Work legislation that is now taking effect. In December, legislators and the governor showed amazing disrespect for the working people of this state. They locked us out of the capitol, and when Snyder signed the law he told us it was over and we could all go home because it wouldn’t change anything. “Well, we have a message for Governor Snyder: We’ll go home when you do! “The teachers of Hamtramck again find themselves working to negotiate a contract that shows them the respect that they deserve. And we’re going to continue to be united. We owe it to those brave teachers that occupied this building. We owe it to ourselves and to the future generations. “Right to Work may be the law of the land for now, but working people and their labor movement will outlast these destructive policies. After Cook’s speech, the teachers marched down Jos. Campau.